Yesterday afternoon I had an opportunity to share a workshop with teachers at my previous school, Independence Elementary in Yukon Public Schools, about configuring and using KidBlog websites as classroom blogs. 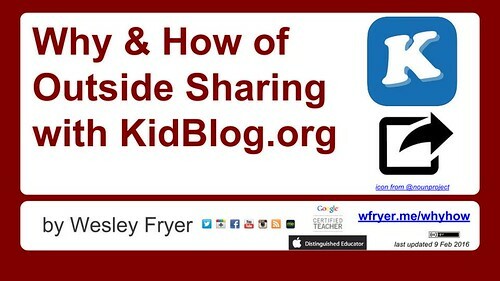 I titled this presentation, the “Why and How of Outside Sharing with KidBlog,” and am embedding my Google Slides which I used during the workshop below. In this post, I’ll share some background as well as a 50 minute narrated (and enhanced) version of this presentation which I recorded tonight by app smashing with Google Slides, Explain Everything and YouTube Capture on my iPad. I served on a teacher team last year to help write successful OETT Phase 2 Grant from the K-20 Center at the University of Oklahoma. The focus of this grant is “interactive writing” for students to improve literacy and communication skills. To meet the goals of our grant proposal, the school purchased a number of iPads for students and teachers to use, along with an “Admin Pro” membership to KidBlog so each teacher can have their own moderated classroom blog. The Admin Pro account also allows a local administrator (in this case, the school librarian) to help manage and moderate all the blogs in the school. This academic year is the first time the Yukon Public Schools IT department and administrative team have provided Google accounts (part of the Google Apps for Education program) for 4th and 5th graders. As a result, since KidBlog supports teacher as well as student logins via Google, KidBlog users at IES are able to login to their sites using their district-provided Google accounts. Here are the slides I used yesterday in the workshop, with about 15 new slides I added tonight with additional information about getting started with student blogging. You can also link directly to the slides using the shortened web link: wfryer.me/whyhow. The concepts in the phrase “Inside and Outside Digital Sharing” are really important, and were developed by my wife (@sfryer) and I last month when we traveled to Manhattan, Kansas, to present a full day iPad integration workshop for 160 teachers at Kansas State University. We discussed these ideas in a podcast reflection we recorded and shared on January 18th, and I elaborated on them in this face-to-face workshop as well as in the narrated slideshow version of this presentation. 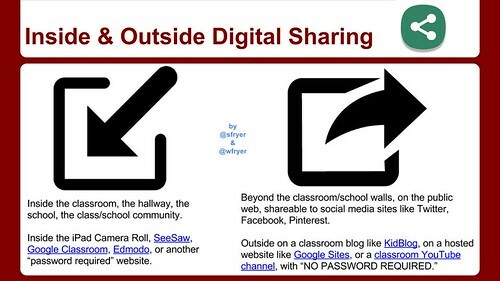 We need more classroom teachers to regularly engage in “outside digital sharing” to share student stories of learning! Here is the link to the 50 minute narrated slideshow of my presentation. If you find this helpful and use it, please let me know by writing a comment on this post or sharing a Twitter reply to @wfryer. Access more resources about interactive writing on ShowWithMedia.com. Interesting and informative article. I am getting ready to incorporate blogs in my second grade classroom. I am concerned due to lack of technology but understand the value. Your page will give me a good like to share with the students’ parents as I approach them with this project.